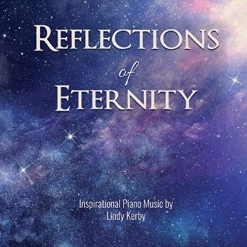 Reflections of Eternity is the enchanting and inspiring third album from pianist/composer Lindy Kerby. The album includes twelve piano solos, eleven of which are original compositions and an original arrangement of “Amazing Grace.” All twelve pieces flow with a graceful, soothing beauty that stays fresh even after many listens. A variety of moods and emotions are expressed in the music and yet the album plays smoothly from the first note to the last with ebbs and flows rather than sudden dramatic changes. In addition to her music, Lindy Kerby is an inspirational speaker, singer and songwriter as well the mother of seven children, so it is no surprise that there have been a few years between each of her albums! It was discovered during the process of writing this review that the order of the songs listed on the back of the CD jacket is different from the playing order listed on Amazon, the iTunes player and the streaming sites. Because of that, the titles in my review might not match the titles on the jacket. I contacted Lindy Kerby and she said that the titles on the iTunes player and the retail and streaming sites are in the correct order so my review will match all but the CD jacket. Reflections of Eternity begins with the title track, a piece that could have been created late at night while reflecting or soul-searching at the piano. This piece grabbed me right away and touches me each time I hear it. “Daydreams” is much lighter, expressing the peaceful warmth and contentment of happy thoughts. “Katelyn’s Theme” seems to come from a place of deep love and optimism. I really like this one! The gentle, peaceful “In a Special Place” could refer to a physical location or an especially pleasant state of mind. Either way, it’s a very good place to be, and the music wraps the listener in comforting bliss. “Overcoming” is a bit darker and more turbulent, but never nears despair. I really like this one, too! “The Christmas Spirit” is a peaceful and meditative reflection on the true meaning of that very special time of year. Memories of times and people from the past always seem especially poignant during the holidays, and this piece expresses that very well. Change can be exciting, but it can also be a bit intimidating and “Winds of Change” beautifully conveys both. “In Gratitude” flows from a place of sincerity and grace - an expression of thanks that comes from the heart. “Becoming Real” is another favorite. As it unfolds, it seems to be telling an uplifting story that just keeps getting better. The closing track is a lovely solo piano arrangement of “Amazing Grace,” a hymn that never gets old. Simple and expressed with heartfelt emotion, it’s a beautiful close to an excellent album. Reflections of Eternity will very likely be one of my favorite albums of 2019. It is available from www.LindyKerby.com, Amazon, iTunes, CD Baby and various streaming platforms.